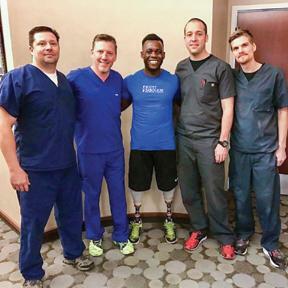 Blake Leeper and his prosthetic team at Scott Sabolich Prosthetics. Blake Leeper, an eight-time Paralympic Track and Field international medalist, world record holder and three-time American record holder, knows all too well the hurt that accompanies falling down. Physically, he has fallen down time and again due to being born with no legs. In the eyes of the Paralympics community, he has fallen from grace due to self-admitted bad personal life decisions. 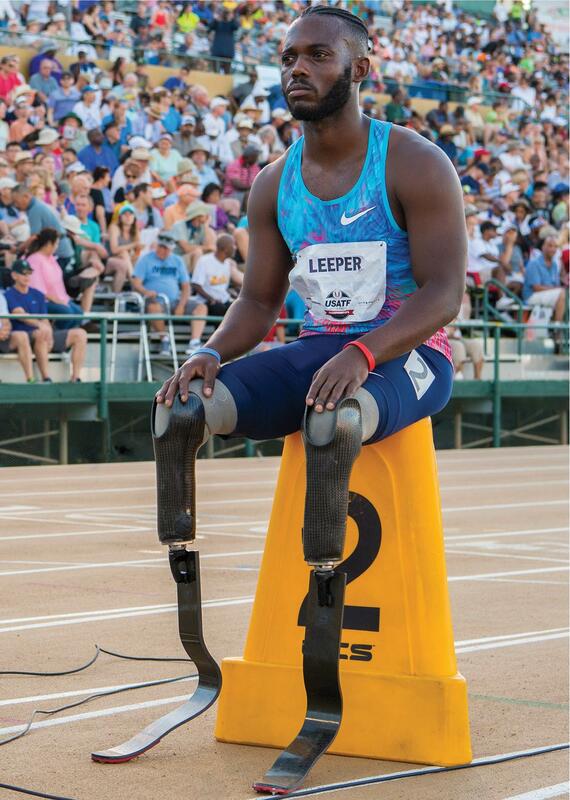 But every time Blake Leeper has fallen, he has got back up stronger than ever before. And each time, he has risen with a newfound purpose in his life. Born in the Smoky Mountains of Tennessee, Blake has defied the odds since the moment his parents Billy and Edith welcomed their baby boy in 1989. Doctors told Leeper’s parents that the best case scenario for their legless son would be living life in a wheelchair. Fortunately for Leeper, his mother knew better. Edith worked as a nurse and was heavily involved in the medical community. “This is not going to be his story,” Edith told those doctors and her husband nearly 30 years ago. Truly prophetic, Edith knew the key to changing the course of her son’s life was prosthetics. Fast forward four years, and young Blake had major surgery so that his first legs would fit his little body better. For eight long weeks, Blake was in a full body cast and a wheelchair. Blake, armed with legs for the first time, literally hit the ground running. He played any and every sport. He roller-bladed with his older brother Kris. So many times in those physically formative years, Blake’s legs would break or fall off, but he would always get back up. His main objective was to show the world how much he could do with his new legs. In high school, Blake’s best friend just happened to be the best athlete on campus. His name was Coty Sensabaugh, who is currently starring at cornerback for the Pittsburgh Steelers. After high school, Blake enrolled at the University of Tennessee as a pre-med student. He was ready to hang up the sneakers and become an orthopedic surgeon. That all changed the moment he saw Oscar Pistorius sprint across his television during the 2008 Olympics. Blake got his first pair of running legs the next year. Before he even had time to start seriously training, he and his parents drove 14 hours to Oklahoma to participate in the Endeavor Games and his first ever race. As a rookie competing in a field stacked with national champs, the odds were stacked against him. The doe-eyed novice took first place in all three events he raced in: the 100, 200, and 400 meters. Two whirlwind weeks later, Blake found himself racing in an international event in Brazil. He ran even faster than he did in Oklahoma, won a silver medal and came close to conquering the world champion. In 2012, Blake tied Pistorius’s record time in the 400 meters going into the London Paralympics. He was ranked #1 in the 100, #1 in the 200, and #2 in the 400. In London, Blake won the silver medal in the 400 behind previous inspiration Pistorius and took home the bronze in the 200. Only a few years after getting his running blades, Blake became a celebrated media mainstay. He played alongside superstars Kevin Hart and Chadwick Boseman in the NBA All Star Celebrity Game. His positive personality was welcomed on The Queen Latifah show, the Arsenio Hall show, and the Naomi Campbell fashion show. For the first time in his life, Blake was making big money. Relying on talent, Blake was able to pull off the delicate balancing act of partying and still competing and winning. He broke every American record. He seemed invincible on and off the track. In 2015, Blake did cocaine and a week later raced in the US Paralympic Nationals, breaking the American record. But he failed the drug test. The punishment was a one year suspension, reduced from two years behind the promise that Blake would get clean. The story broke in the Los Angeles Times. A purpose was knocked down. But it would get back up. Determined to come back stronger and faster after serving his suspension, Blake needed to find a new pair of running legs. Aaron Holmes from Wiggle Your Toes connected Blake with Scott Sabolich Prosthetics. Blake walked into the building, back in Oklahoma where his racing career had begun, for the first time wearing two different pairs of legs that he had duct taped together. Refocused, Blake was ready to prove that he was the fastest amputee in the world. Along with the new legs, he obtained new coaches, management, a trainer, and a nutritionist in preparation for the 2016 Paralympics in Rio de Janeiro. Running was no longer a hobby or a job, it was his life. One year after testing positive for cocaine, Blake dropped his 400 meters time from 48 seconds, an American record at the time, to 46.1 seconds. He made the 2016 Paralympics team. After that life altering phone call, Blake went to his room, took off his legs and didn’t leave for three days. His coaches had to bust down Blake’s door to get him out. He walked out of that door a new man. A fun and easygoing soul, Blake was mad and trained with a chip on his shoulder. 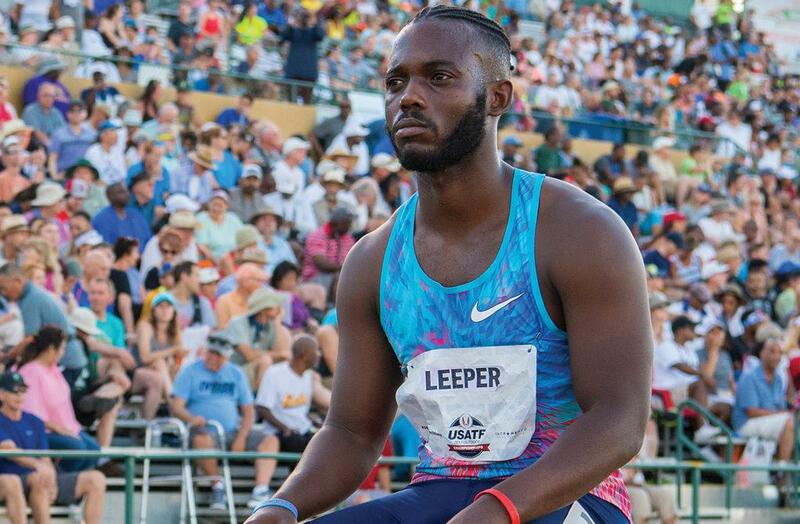 The 46.1 he ran qualified him for the 2017 able body national championships, making history as the first amputee to qualify for any national championships. At trials, Blake ran a blazing 45.5, qualifying for the semifinals. The man with no legs beat 2016 Olympians. The next day, Blake ran a 45.25 and broke Pistorius’s amputee world record, a personal goal of his from day one. He finished 12th overall out of top 64 fastest runners in the nation. To make the 2020 Olympic relay team, Blake needs to cut his time down about half a second and place top 6 overall. That’s his primary focus on the track these days. But it’s getting his life off the track back on the right track that defines the man. Edith Leeper was right. Being in a wheelchair would not be her son’s story. His story is one of triumph, tragedy, redemption and most importantly, purpose. And it’s a story that he fully embraces and loves.